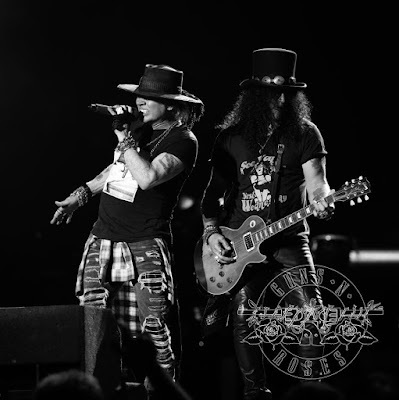 Guns N’ Roses performed the AC/DC classic, “Whole Lotta Rosie”, in Hartford, CT on October 23 as a tribute to the Australian band’s late producer George Young, and video from the concert has surfaced online. George Young – the older brother of AC/DC guitarists Angus and Malcolm Young – passed away on October 22 at the age of 70. “It is with pain in our heart that we have to announce the passing of our beloved brother and mentor George Young,” said the brothers in a statement. “Without his help and guidance there would not have been an AC/DC. Originally based in Glasgow, Scotland, most of the Young family emigrated to Australia in 1963, with George forming The Easybeats in Sydney a year later. The group scored a 1966 No. 1 hit in the members’ adopted homeland with “Friday On My Mind”, written by Young and guitarist Harry Vanda. The pair produced the first five AC/DC albums – from their 1975 debut, “High Voltage”, to “1978’s “Powerage”, as the band became stars in Australia while gaining pockets of support around the world. Guns N” Roses frontman Axl Rose joined AC/DC for the final 2016 dates of their “Rock Or Bust” tour after singer Brian Johnson was advised by doctors to leave the trek due to hearing loss issues. Angus has occasionally joined GNR on their Not In This Lifetime reunion tour, including a recent July 2017 appearance in Nijmegen, Netherlands.